Kurtis has the right idea. 188 feet with 4 downspouts would create four 47' sections. You would need at least 4 expansion joints. You might check the SMACNA guidelines for expansion joints, which vary according to gauge of copper, bottom measurement of gutter, etc. Wow, that is huge. I assumed it was 30 linear feet. The mesurement areand the rotunda fascia is 188' - there will be 4 downspouts spaced equally areound the structure. The radius is 30' - i think i can get away with 3-4' sections. I dont think 1 expansion joint is sufficent. Is there one downspout, or one on each side of the rotunda? If there are two downspouts, be on the safe side and put an expansion joint in the middle. You're going to have to rivet, or single lock each seam you do anyway. I'm guessing you didn't mean the radius of the arch was 30', that would be a very gradual curve. Make the segments as big as you can to get through the curve. If you have a shrinker/stretcher, use that on the drip edge to get a uniform curve all the way around. I am bidding a project that has a copper built in Radiused gutter. The gutter goes around a rounda - it is approx a 30' radius. 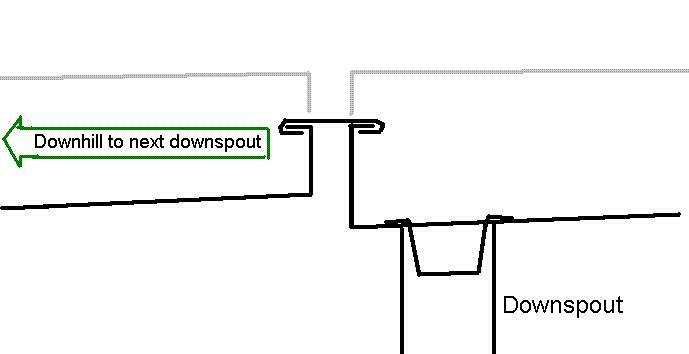 Would expansion joint spacing be impacted by the gutter being in a radius form instead of a straight run? Back of gutter goes up fascia 8" bottom is 4" front is 6". Would you try to rivet and solder togather 10' long sections or just do 3' sections all the way around the circle?